This article is about the artist. For the basketball coach, see Pete Newell. For the former American football player, see Pete Newell (American football). Peter Sheaf Hersey Newell (March 5, 1862 – January 15, 1924) was an American artist and writer. He created picture books and illustrated new editions of many children's books. A native of McDonough County, Illinois, Newell built a reputation in the 1880s and 1890s for his humorous drawings and poems, which appeared in Harper's Weekly, Harper's Bazaar, Scribner's Magazine, The Saturday Evening Post, Judge, and other publications. He later wrote and illustrated several popular children's books, such as Topsys and Turvys (1893), a collection of poems and images which could be viewed upside-down or right-side-up; The Hole Book (1908), which had a literal hole at the center of each page to indicate the path of a bullet; and The Slant Book (1910), which took the shape of a rhomboid and told the story of a baby carriage careening down a hill. Newell often illustrated the works of other authors, such as Mark Twain, Stephen Crane, John Kendrick Bangs, and Lewis Carroll. He also created a comic strip serial, The Naps of Polly Sleepyhead, which debuted in the New York Herald in 1905. He died in Little Neck, New York in 1924. ^ "From the Rare Book and Special Collections Division". ^ a b Dennis Wepman "Newell, Peter" American National Biography Online. February 2000. Retrieved on July 6, 2009. 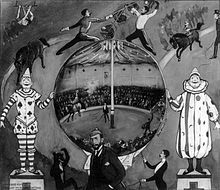 Wikimedia Commons has media related to Peter Newell. This page was last edited on 20 December 2017, at 07:51 (UTC).